Who Fired on Israel from Lebanon? Can Israel Survive Its Assault on Gaza? Despite the frenetic efforts of the posse of diplomats charging between Cairo and Jerusalem, an immediate end to the carnage in Gaza remains unlikely. Instead, Hamas and Israel are bracing for another deadly round. No matter how many Palestinian families are destroyed in the crossfire, neither combatant is ready to accept the other's truce terms. Hamas leaders in Syria on Thursday announced their rejection of a Franco-Egyptian plan for a cease-fire. In Jerusalem, the Israeli Cabinet is readying for a massive ground assault on Gaza City's densely populated maze of alleys, where thousands of Hamas fighters await with booby traps and other nasty surprises  and hundreds of thousands of civilians cower. Israeli planes dropped leaflets on Wednesday calling for the evacuation of more than 20,000 Gazans from their homes near the Egyptian border crossing of Rafah, so that the Israelis can begin bombing to destroy a network of smugglers' tunnels along the border. Such scenes of horror will multiply if Israeli troops are drawn into Gaza's teeming neighborhoods in search of Hamas' 20,000 fighters. Says TIME's Gaza correspondent Azmi Keshawi: "Whenever there's an Israel attack, people flee their home. But now there's nowhere left to run, so people say they'd rather stay put and at least die at home." Israel will call off its ground assault only if the Israeli envoy now in Cairo, Amos Gilad, returns with an iron-clad promise that Egypt or an international force can effectively stop Hamas' border traffic in weapons and medium-range rockets that are capable of striking deep into Israel. "We won't end the Gaza operation without some kind of suspension of the arms smuggling," one senior Israeli official told TIME. "The next phase is inevitable." Since the Israeli offensive began, the number of rockets fired by Hamas has tapered off from nearly 100 a day to around 24 on Thursday, but large Israeli population centers remain within firing range. Hamas is just as adamant. Its four delegates returned from Cairo to Damascus and their Gaza bunkers resolved to fight on. Israel says it has identified at least 200 Hamas members who have been killed thus far, but a Hamas official in Damascus told TIME, "So far we have only lost 60 martyrs. We're prepared to lose many more." Advancing Israeli troops have had to thread through complicated Hamas defenses of roadside bombs and booby-trapped houses, and they are using robots to clear Hamas' maze of tunnels. The peace proposal promoted by France and Egypt remains on the table, but for now Hamas has said no to it. The Islamists doubt that Egypt can be an honest peace broker, as it is allied with Israel and the U.S. and is politically antagonistic to the Islamist movement. Hamas says it is refusing Israel's key demand for an international force to be deployed on the Gaza-Egypt border to prevent arms smuggling. "It will be doing the job of protecting Israel, not the Palestinians," said the Hamas official. Israel plans to fight on until it is satisfied that it has choked off the possibility of Hamas rearming itself via smuggling from Egypt. But Hamas believes it is winning the political battle. The Hamas official in Damascus said the organization believes Israel played into Hamas' hands by attacking Gaza, earning Israel international criticism and strengthening Hamas' position among Palestinians and in the wider Arab world. 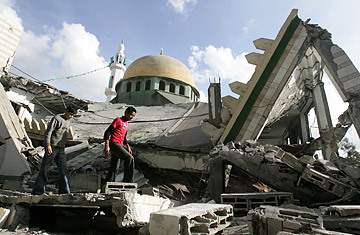 "The destruction is such that nobody will dare to mention peace with the Israelis for the next 10 years," he said. Meanwhile, Israel got a brief scare on its northern border early on Thursday, when three rockets fired from Lebanon landed in an Israeli town. Although the rockets did little damage, they raised fears that the Lebanese militant group Hizballah might be opening up a second front. But Hizballah denied firing the rockets, and most observers concur that the Shi'ite group was unlikely to have been responsible. Hizballah would probably have fired a much larger fusillade were it looking to join the fight, and it would be unlikely to risk its considerable political gains in Lebanon since the 2006 war by provoking a new Israeli attack. The more likely culprit in this instance is one of the many Palestinian splinter factions based in Lebanon, which is home to some 400,000 Palestinian refugees. Besides sympathizing with their brethren in Gaza, Palestinians in Lebanon have often been used as cannon fodder by regional intelligence agencies, and the impoverished refugee camps where about half of them live are incubators of discontent and chaos.